In any Kikuyu traditional homestead, the woman’s hut was the cradle of the family traditions and it loomed over the traditional homestead both in physical size and psychologically. The English word ‘house’ to the Kikuyu mind refers to any building, but ‘house’ in Kikuyu, Nyumba, in the context of a home is that which was built for a specific married woman as no two married women ever shared a house. The man’s habitation is a thingira and is properly what the word ‘hut’ conjures and it is improper to refer to the woman’s abode as ‘the woman’s hut’ as it cannot be a hut. To the Kikuyu mind, Nyumba, as a proper capitalized name always refers to the woman’s “house” and must be differentiated from a generic uncapitalised nyumba, which means any building. The man’s habitation is the thingira which however can never be capitalized as a proper name as there are many types of huts which lay claim to the name thingira like those built for young unmarried men or exclusively for goats but generally, a thingira is any habitation built for the exclusive use of the male gender. 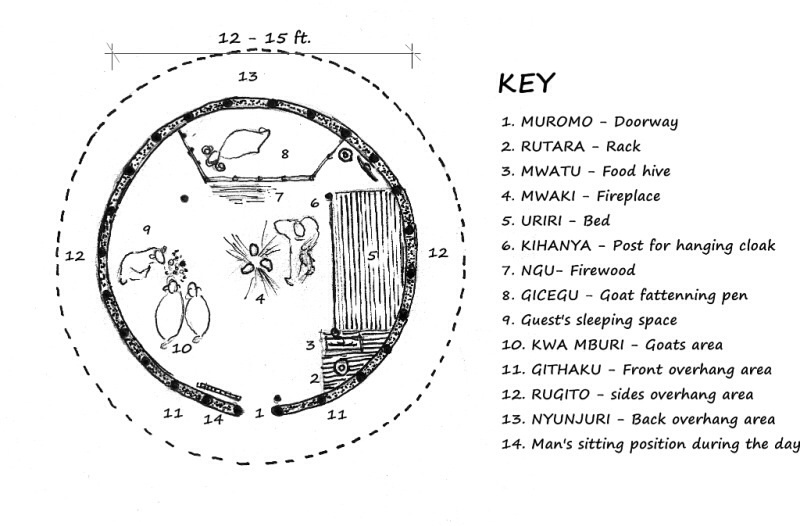 A nyumba in the context of a Kikuyu homestead refers to either a Nyumba or a thingira without distinction. Outside this context a nyumba means any building. As the Kikuyu were polygamous, a traditional homestead had several Nyumba as each wife had her own but only one man’s thingira. Circumcised but unmarried young men had their own young men’s thingira. Children and unmarried girls slept in the Nyumba. Girls and even children could distribute themselves in the various Nyumba and all the mothers were considered common to all. Every mother treated her co-wive’s children as her own and could feed and house them for the night if they fell asleep in her place listening to her fireside tales. These Nyumba were arranged around an open space, Nja that accommodated many outdoor activities especially food preparation. Each woman had a granary for her farm produce and they were all build near the entrance to this Nja with the first wife’s, nyakiambi being prominently nearest the entrance and the others supporting her. The man’s thingira was also built near the entrance slightly removed from the intimate conversation the various Nyumba made with the Nja. The first wife ruled this inner world, Nja and the homestead and the man was an appendage that had a stronger connection with the external world and the cattle krall, palisaded with a gate visible from the man’s thingira’s doorway. The first wife ruled this whole arrangement and because many of her activities, drying grain, pounding grain, cooking etc happened here, the female species acquired the name, Mundu-wa-Nja, or Person-of-the-Nja. A nyumba can have only one door which normally faced the Nja though the man’s thingira had its door slightly askance from the courtyard. If there were young circumcised but unmarried men, with their own thingira it would never ever have a conversation with the Nja but would be located nearest the gate. After marriage young men were expected to move out of the homestead and establish their own. Several posts within the space but on the man’s side, kihanya would be used to hang his cloak, githii and leather bag. He would also keep his weapons, bow and arrow, spear and shield near him at the foot of his bed. Young men’s thingiras were arranged with sleeping beds on all three sides save the entrance and without a fattening pen. Sometimes young men from neighboring homesteads could share a thingira until they married and each established his own homestead. There was usually no fire inside the young men’s thingira, but rather an outside one. During the day in the heat, the man seated on a stool would shelter under the shadow of the overhang just outside his door to the left or right. His walking stick would be beside him and if he entered inside he would go in and leave his walking stick next to the stool. If he left the compound he would carry the stick with him and sometimes even the stool. It was therefore easy for anyone to tell whether the man was in or away merely by the presence or absence of the walking stick and stool. Sometimes a young couple used the Nyumba for conjugal purposes but this would later become impractical and undesirable as the children grew older and then the function shifted to the thingira more so if he acquired many wives. Because Kikuyu men sometimes married as many as ten wives there is an interesting story as to how this rotation was managed. When and why men began to live separately in a thingira is not on record, but it is a fact that a man cannot enter the Nyumba before all the children and animals have entered and everything has settled nicely. He MUST be the last to enter. The thingira may have started as a warm space to kill the time while as they say, “the chickens go in” and while waiting for the food to cook rather than waiting out in the cold or in the sometimes very noisy Nyumba exactly the function bars and clubs perform today. It could then have developed into a fully fledged habitation where he stayed permanently and entertained his friends. His presence in the Nyumba however remained with a symbolic stool which he rarely used. The thingira was where the man sat in the evenings in contemplation in front of a fire alone or with a friend and was rarely used during the day. The thingira was a quiet abode of contemplation, a retreat into the quiet uncluttered fundamental substance of life, – kanyumba ka meciria, something forever gone with the “wind of change”. The Nyumba was a noisy classroom. i would add, Nyumba was thus termed as its where ‘formation’ of the family started (kumba). Thingira was so termed as it is where the man, who now had grown children and various wives would solve family conflicts (guthinga). Young men had no thingiras but hut like structures called Ndoomo. No conjugal activities ever took place in the thingira because as the name portends; thingira means Holy!! Thanks.